The Woodland Embossing folder is one of the great new products in the 2015 Holiday Catalogue which will be launched on 1st September. One of the benefits of being a Demonstrator is the pleasure of pre-ordering from new catalogues. I can't believe that I nearly didn't buy this beautiful embossing folder! It took me a while to see its versatility and what I could do with it. I really had a lot of fun with it yesterday! I thought this would be good for a masculine birthday card. I embossed some Lost Lagoon card and then sponged the trees with Lost Lagoon and Soft Suede. Then I layered it onto a piece of Soft Suede before adhering it to my Island Indigo card. 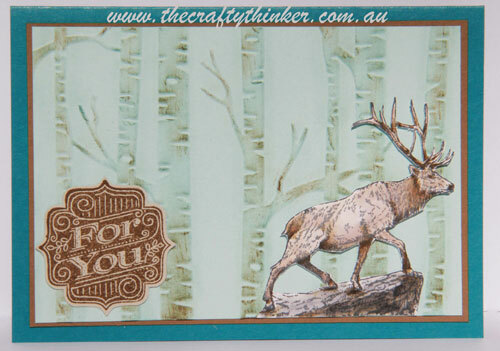 I stamped, coloured and fussy cut the stag from the Wilderness Awaits stamp set and then stamped the greeting from Tag Talk in Soft Suede onto Sahara Sand card and punched it out. This time I embossed Whisper White cardstock. 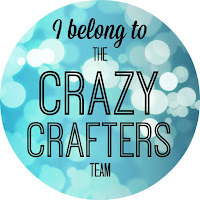 I ran my 2-way glue pen over the embossing and then sprinkled with Dazzling Diamonds glitter. Then I layered this onto my card of Thick Whisper White. I stamped the bear from White Christmas, added a little shading with Soft Sky ink and fussy cut him before sticking him down. He's looking up at the bird from Santa's Gifts which I stamped onto Whisper White, Coloured and cut out. The greeting is from Happy Scenes - I just manipulated it to fit into the banner from Project Life Hello December 2015 (one of the advantages of photopolymer stamps!). I coloured it with Soft Sky and Pool Party inks and cut it out. I placed it at an angle in the corner to complete my triangular composition. I inked my embossing folder with Soft Sky ink before I added the Whisper White card and ran it through the Big Shot to get a coloured background. 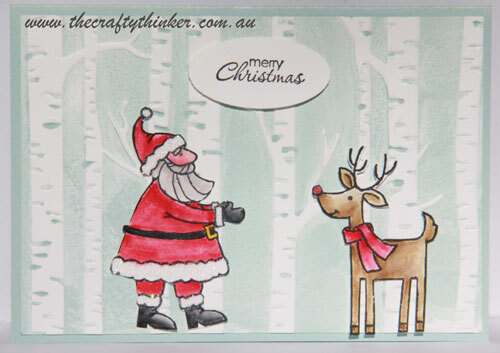 Santa and rudolph are both from the Santa's Gifts stamp set. I added some Dazzling Diamonds to Santa's fur and Rudolph's nose. The greeting is from Petite Pairs which I punched out with the Large Oval punch. The base card is Soft Sky. I hope you enjoyed these cards. If you have a demonstrator that you order through - to be fair to both them and me, please ask them for a catalogue. If you can't wait - then join now and shop for new Holiday Catalogue items right now PLUS at a discount! $235 of ANY product you like and you only pay $169 PLUS free postage. Its such a great deal - you then get 20% off any items you purchase after you sign up for the starter kit. There is no obligation to sell - you can join just to get great products cheaper.